To help the transplantation community stay abreast of recently published high level evidence in organ transplantation the Centre for Evidence in Transplantation (CET; www.transplantevidence.com) has developed the Transplant Trial Watch app. 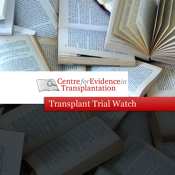 The Transplant Trial Watch app provides a monthly overview of 10 recently published randomised controlled trials (RCTs) in solid organ transplantation. For each RCT record includes a summary of the trial, an assessment of the reporting of some methodological quality features, the main conclusions of the report written by the CET, and funding and trial registration information. There is also a direct link to the publisher’s website to access the journal’s abstract. If you hold a subscription you can also access the full text paper. RCTs are selected by the CET on the basis of quality or interest. Electronic publications ahead of print are listed as [record in progress]. You can browse previous issues of the Transplant Trial Watch by organ or month. You can add articles that are of special interest to you to your own favourites. Easily share the Transplant Trial Watch with colleagues via email.